Two weeks ago, we talked about some of the ways that the arts benefit your kids. This week, we want to get a little more specific. Did you know that music lessons can benefit your kids in all kinds of ways? It’s true. We’ve only listed five of those ways, but if you enroll your children music lessons, you’ll see far more than just these five. For now, though, let’s take a look at our favorite reasons why you should seek out music lessons for kids. Music lessons for kids can help little ones see the world in a completely new light. As they learn to recognize musical patterns, they’ll be able to see the world in new, creative ways. They’ll also experience music from different genres and eras, which will help them gain more awareness. Young kids are wired to assume that the rest of the world sees from their viewpoint. Exposure to new music will help them take in new perspectives in a gentle way. This benefit will impact kids of all ages, but you may notice the most difference with your young children. Learning to play an instrument or learning how to sing requires intense muscle coordination. 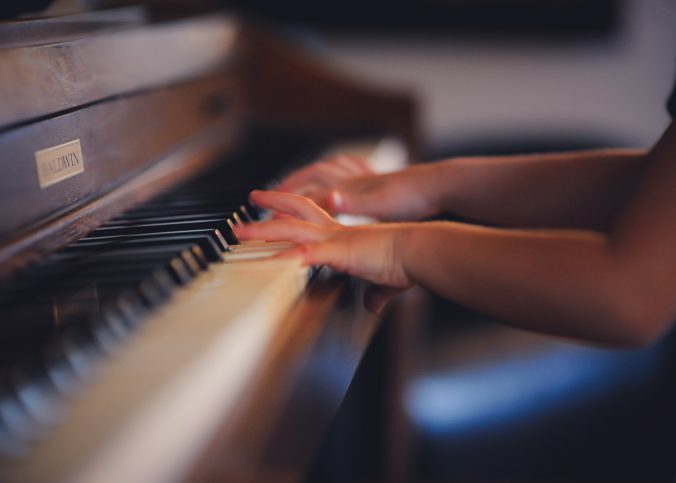 Whether your children learn how to move their fingers across a piano, engage their vocal cords properly, or control the bow of a violin, they’ll slowly but surely improve their motor skills. Since we already said “slowly but surely,” let’s talk about how music lessons can improve a child’s focus. Learning a musical skill requires steady practice. While most kids want instant gratification, a child who takes music lessons will learn how to wait for gradual improvement. He or she will learn how to focus and work for that improvement. Often, the ability to focus works like a muscle. The more one practices using it, the better one gets at using it. Music helps kids work that muscle and get better at using it over time. Music lessons for kids can help with math skills. If your kid loves creativity but doesn’t like math, consider placing him in music lessons. Music can introduce your creative child to math in a more enjoyable way. A person who plays music has to count, measure beats, and even work with fractions. This skills can translate to better grades in the classroom. As children learn how to play music, they get a lot of repetition. They also sometimes have to memorize songs for recitals and concerts. Furthermore, music in general helps provide a memory boost, as people sometimes attach memories to melodies. Thanks to these facts, music lessons for kids can help your children develop excellent memory skills. Once again, these skills can help in classroom settings and beyond. Now that you know just a few of the benefits, are you ready to start looking for music lessons for kids? With iQurious Kids, you can find what you need in a single database. Find music lessons for your kids today.